I want to propose an Anthropocene territorialization and a subject-making project in which anthropologists might want to engage. The territory of which I write is a place called Iowa. For many living in precarious situations, the Anthropocene is already life-altering, life-threatening, and even deadly. It comes in the form of a massive flood or a rising tide that takes their homes away. Or as an oil well that poisons the river on which they depend. But for others, especially the white and middle-class of the global North, the Anthropocene is so banal that they do not even notice it. It is the green front lawn, the strip-mall parking lot, the drainage ditch where only bullfrog tadpoles remain. 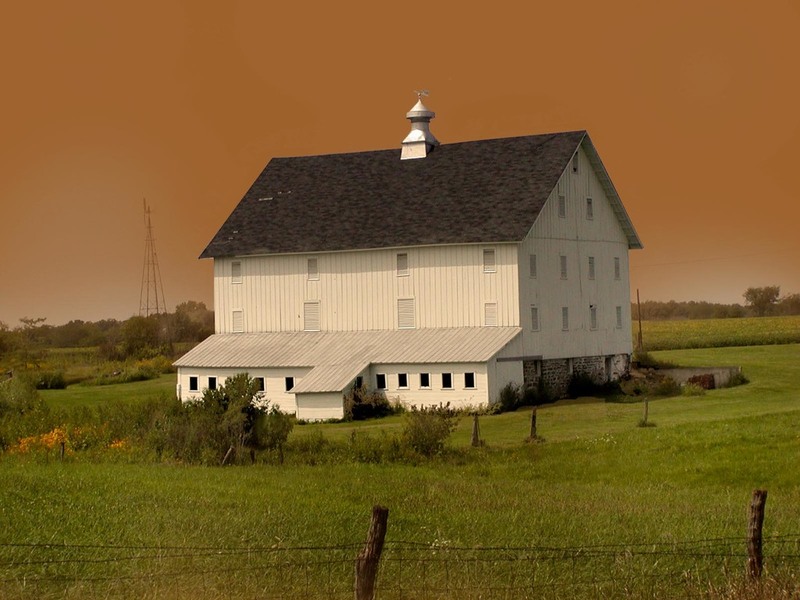 Iowa lies at the heart of this banal Anthropocene. The Anthropocene, here, is wholesome. It is the cornfield and the industrial pig farm. It is the 4-H county fair and eating hot dogs on the Fourth of July. It is precisely this banality, this routinized everydayness (see Arendt 1963), that makes the Iowa Anthropocene so terrifying. Barn along Highway 1, south of Fairfield, Iowa. Photo by Ken K.
I write of Iowa not from the outside, but from a place of connection. I, too, am Iowa. Without it, I would not be where I am. My mother and father were born and raised in Iowa, and its mid-twentieth-century agricultural modernization and postwar dreams for better futures propelled their upward mobility. It allowed them to get off the farm and become the first people in their families to go to college. Iowa’s industrial agriculture and its surpluses thus made my own scholarly career possible. Indeed, we are all implicated in Iowa. We are all entangled with the everyday violences of industrial agriculture and nationalist projects in a way that substituting an organic latte for the hot dog or shopping at Whole Foods won’t solve. We cannot make ourselves clean. The urbanized coasts are made possible by the production of the heartland. New York is standing on Iowa (see Moore 2010). How is it that Americans, especially white middle-class ones, learn not to notice such entanglements, to not be affected? How do we learn not to see the damage around us? Iowa is objectively one of the most ruined landscapes in the United States, but its ruination garners surprisingly little notice. 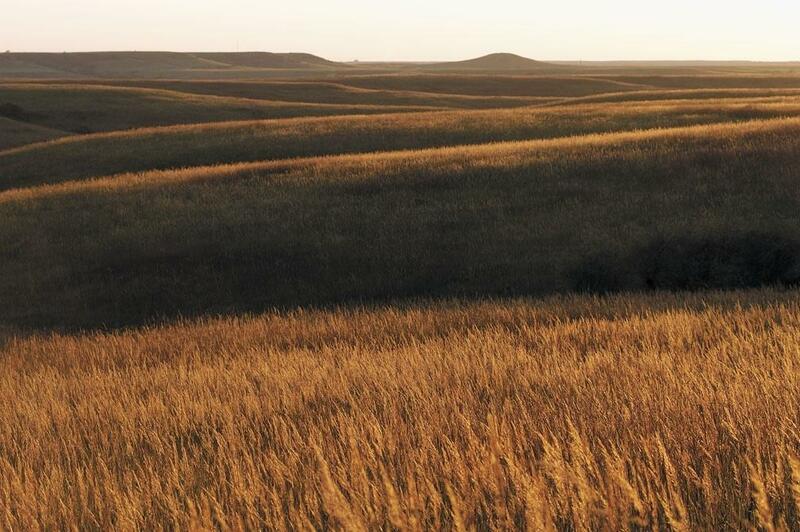 Less than 0.1 percent of the tallgrass prairie that once covered much of the state remains. You’ve seen the Anthropocene J-curves: the rise of atmospheric CO2, human population growth, and dammed rivers, to name a few (Steffen et al. 2015). The decline in Iowa prairie makes a reverse J. Between 1830 and 1910, Iowa lost a whopping 97 percent of its prairie acreage. At one time 85% of Iowa was covered by tallgrass prairie. Source: iowapublicradio.org. But this is only the tip of the iceberg. The reorientation of Iowa’s landscape toward capitalist agricultural production has resulted in the obliteration of worlds that once occupied it. The American Indians who carefully tended the prairie through burning and bison management have been forced out of the state. Nearly every acre has been privatized. 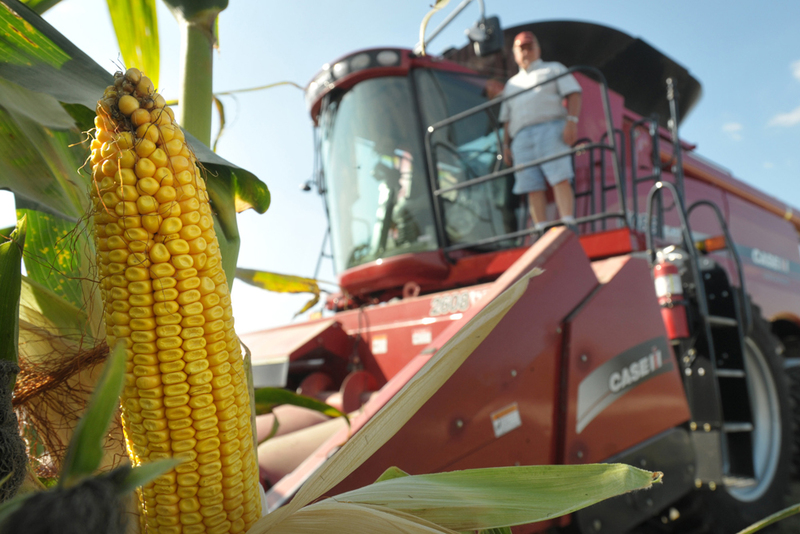 Today Iowa ranks forty-ninth out of the fifty U.S. states in public land holdings. Ninety-nine percent of its marshes are gone. The level of its main aquifer has dropped by as much as three hundred feet since the nineteenth century, largely due to the extraction of irrigation water. Water quality is a mess, too. Between 2010 and 2015 more than sixty Iowa cities and towns had high nitrate levels in drinking water due to the leaching and run-off of agricultural fertilizers. And those same fertilizers wash down the Mississippi River to the Gulf of Mexico, where they have created an aquatic dead zone the size of Connecticut. Few people, either within or beyond Iowa, notice the profundity of these changes. When my uncle, a farmer in northeast Iowa, gazes out at his cornfields, he does not see the annihilation of the prairie, the loss of the bison, or the displacement of American Indian communities. He does not notice the contamination of groundwater, even though he had to redig his well a few years ago due to bacterial seepage from a nearby pig farm. He simply shrugs off such things and wonders what the crop prices will be next year. Iowa corn harvest. Source: AP Photo/ Steve Pope. Blindness proliferates: when my uncle becomes blind to the violence of his own corn, he becomes blind to others in neighboring farmhouses, in the neighboring towns, in neighboring states. He cannot see Standing Rock, and he cannot see why Black Lives Matter might matter to him. It isn’t exactly his fault that he doesn’t notice. White middle-class American subjectivities are predicated on not noticing. They are predicated on structural blindness: on a refusal to acknowledge the histories we inherit. As Deborah Bird Rose (2004) has shown in the case of Australian settler colonialism, dreaming of futures requires blindness to the past. Michel Foucault’s work reminds us that the discourses that shape our subjectivities are not just words; they are also the bricks of the prison, the institutional form of the clinic (see Hirst 1995). But we have failed to see that they are also the monocrop cornfield. Iowa’s landscape infrastructure produces us and the Anthropocene. The cornfield is an assemblage that brings the so-called common good of progress and nationalist growth into being. It produces grain futures markets and cheap hamburgers. How can we better see its terrors and erasures? 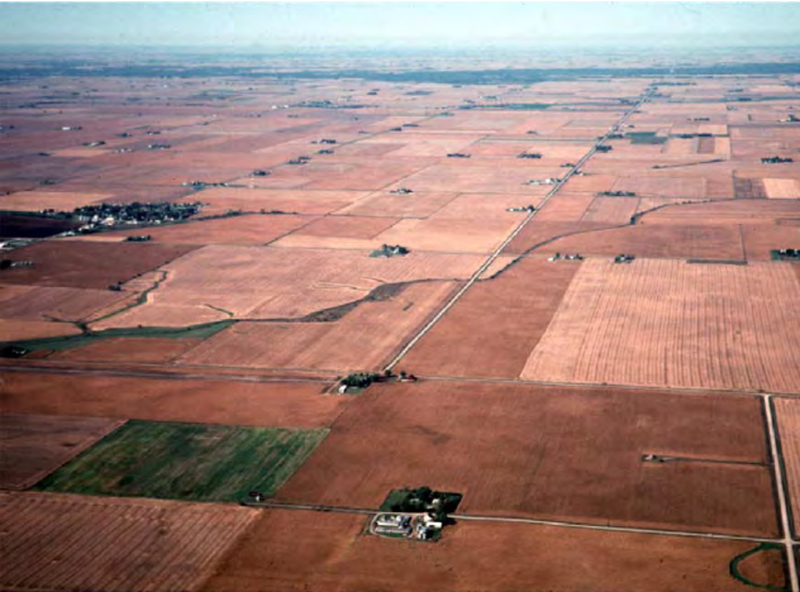 Corn Belt, Iowa agricultural landscape. Photo by R. Corry. One of these terrors is that there are countless Iowas beyond Iowa. I currently live in Denmark, where I am a member of a research project called Aarhus University Research on the Anthropocene (AURA). One of my colleagues, Nathalia Brichet, uses the term “mild apocalypse” to draw attention to the normalized degradation of Danish landscapes. In the midst of Denmark’s rolling fields and highly managed forests, the Anthropocene continues to be stubbornly hard to see. Donna Haraway has called for curiosity as both scholarly method and political practice, as an antidote to these learned blindnesses. In her book When Species Meet, she becomes curious about who and what she touches when she reaches out to pet her dog. That curiosity becomes a radical practice of tracing and inheriting histories, such as the dog-herding practices of livestock-based Australian colonization efforts and the making of purebred dogs. But in a world of structural blindness, such kinds of curiosity do not come naturally. They must be cultivated. But how? How, in the words of Joseph Dumit (2014), do we wake up to connections? Can we imagine corollaries to Bible study meetings or consciousness-raising groups in which people would be encouraged to trace the histories of the landscapes they inhabit, a process that might draw them into new ways of seeing themselves and their worlds? I imagine such practices as a multispecies analogue to Foucauldian genealogy. Might exploring the genealogies of Iowa cornfields, for example, denaturalize them and counter the power of their banality? Might they enable Iowans and all of us to become more curious about the conditions of our own subjectivities and, in turn, how we might transform the landscapes with which they are entangled? This is the important work of making curiosity more common, of troubling the Anthropocene. * Heather Anne Swanson is Assistant Professor at the School of Culture and Society – Department of Anthropology of Aarhus University in Denmark. This article was originally posted in Cultural Anthropology.